Actual size is approx 1 by 3/4 inch. 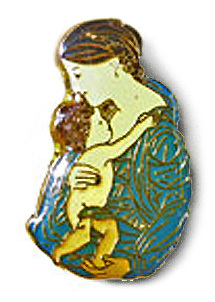 A profile of Mary holding the Christ Child gives this pin its unique design. Mother and Child have dark hair and blue and gold clothing. The figures are beautifully defined with gold lines.